I apologise now for typos and for grammar, I'm running on four hours sleep. I stayed up real late last night to watch my husband and his baseball team, the Canberra Cavalry, make baseball history and win the Asia Series Baseball tournament in Taiwan. They weren't expected to win a single game, so it has been a total Cinderella story that has seen them win the series and the half million dollars prize money. They played amazingly as a team, and I'm in awe of my incredible husband, who as the oldest player in the tournament at 40, batted .545! Way to go Cavs! I can't wait for him to get home. It's amazing how much our partners do for us that you know they do, but you don't really notice - that is until they are not there. Now to a NOTD that I wore last week.I received some pretty shaded rose water decals from the Born Pretty Store and I decided to wear them with matching gradients. These water decals don't have a white backing so you can layer them over any colour you like, although layering them over a light shade will give you the best results. 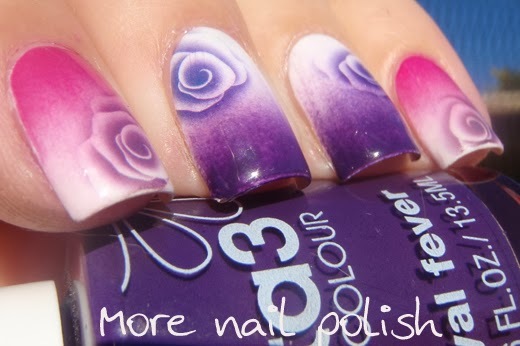 The pack comes with six rose decals in three shades. I used a combo of the pink and purple decals. 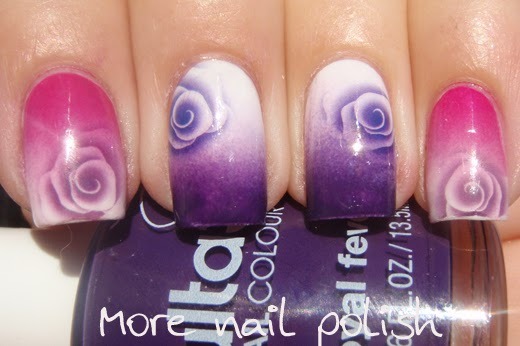 I did a gradient using Ulta3 lily white and royal fever for the purple nails. For the pink nails I used lily white and another Ulta3 - although with my brain in its tired mushy state, I can't remember which one. I had the sweetest comment from a colleague at work with these nails. She said, "Oh wow, your nails are soooo pretty today", to which I replied "my nails are pretty everyday". She laughed and agreed, but said these really were something quite special. The decals are from the Born Pretty Store and cost $1.86. If shopping at the BPS, you can use my code of MNPG10 for 10% off - or just use one of the hundred other BPS codes from other nail bloggers. Don't forget to keep guessing those golds ladies. If you are a member of a social network nail board, why don't you pool your ideas and make sure your in the running for the amazing prizes. So glad they won!!!!! 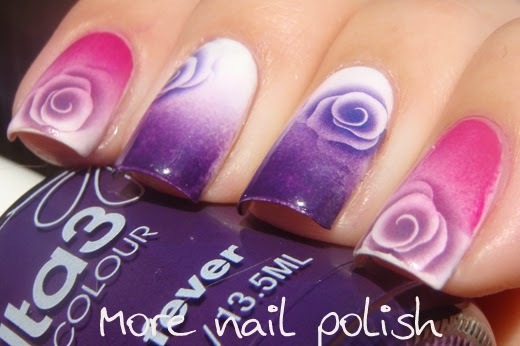 !say congrats from all your nail fans! 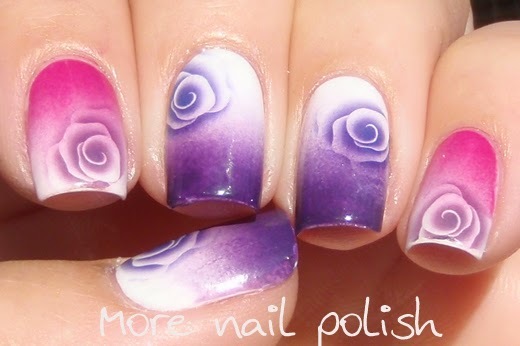 oh and amazing nails too! 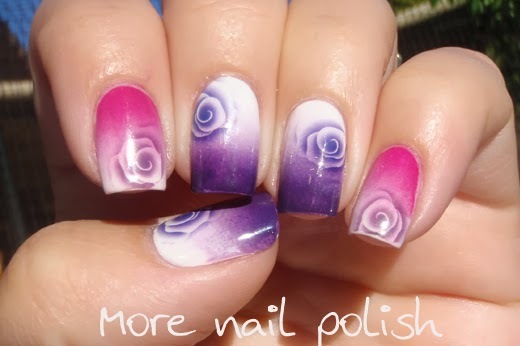 Well done Mr More Nail Polish :D And those decals are awesome!! Congrats to him! 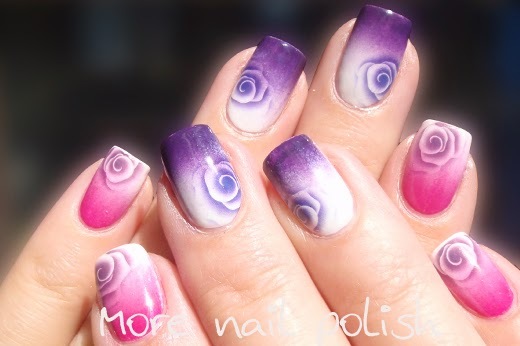 I know what you mean about missing him while he's away :) I like that you chose pink and purple for this rose mani!